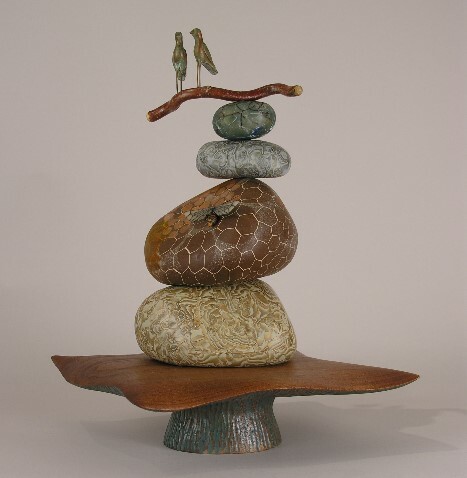 A departure in theme for me, my new sculptural vessel piece, Birds n’ Bees Cairn, was finished just in time for the annual Art You My Valentine? exhibit at the Mansion at Strathmore (February 2 – 25, 2008). It was a fun piece to make… a little of everything. The underside of the walnut base is carved, and finished with layered paint to emphasize depth. Combined with the smooth, oil-rubbed top, the base has taken on a toadstool effect that I would like to further explore. The bottom two “rocks” are both polymer clay vessels…even in my most sculptural work I feel a pull to make it do something. I was a little concerned that I would have trouble with the upper components being top heavy, but the snug fitting lids hold well. 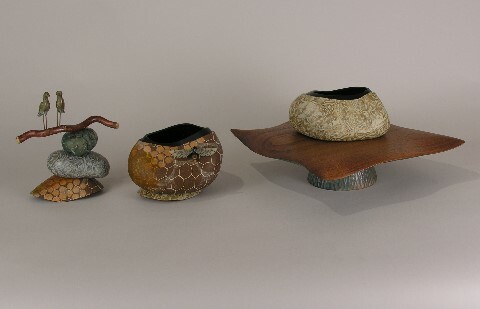 Two of the “rocks” are patterned with the mokume gane technique. The other two are layered with a variety of techniques, including a touch of caning for the translucent bee wings. This piece is the first reflecting my recent interest in cairns. The simplest definition is a pile of stones, but the meanings are vast. Cairns may mark a place of meaning, or be intended to guide. The history is deep for this simple manipulation of natural elements.